"Every month we bring you the world´s best destinations to inspire your next trip away. Every issue includes six themed Mini Guides, Easy Trip ideas that you can book today, a selection of Extraordinary Places to Stay, eclectic insights from our guest Globetrotter, plus two imaginative alternative ways to explore a city. Our storytelling and photography will take you on an incredible journey of fascinating characters and memorable landscapes that you´ll have to add to your wish list. 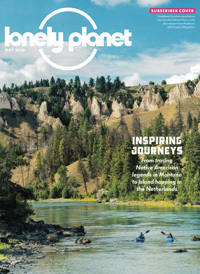 Be inspired, informed and entertained - order your Lonely Planet Traveller subscription today!" Published in English - Monthly. Allow 6-10 weeks for initial delivery.